Tesla will operate its assembly plant in California “24/7" as part of an effort to ramp up production of the Model 3 sedan to 6,000 units per week by June, CEO Elon Musk told the company Tuesday, in an email obtained by Jalopnik. In a lengthy email sent around 12:30 p.m. Pacific on Tuesday, Musk laid out a number of changes that covered production of the Model 3 to expenditures over the coming year, as Tesla attempts to achieve sustained profitability by the end of 2018. Musk confirmed earlier reports that production Fremont and the Gigafactory in Nevada will be suspended for a few days for a “comprehensive set of upgrades,” he said. “This should set us up for Model 3 production of 3000 to 4000 per week next month,” Musk wrote. 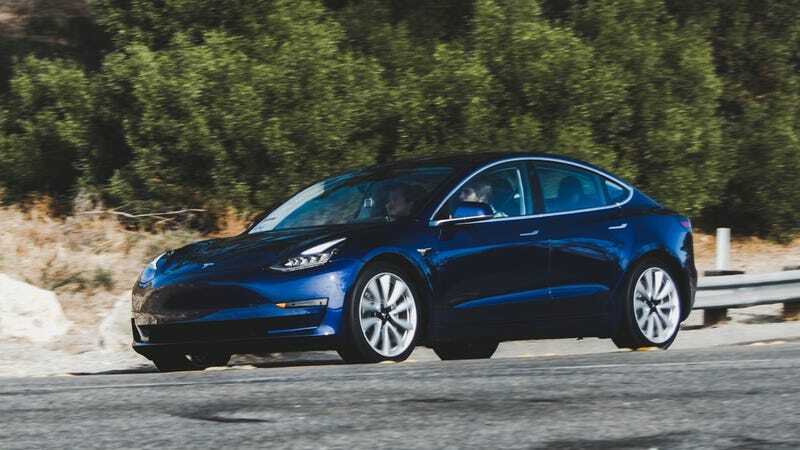 Then, in May, the automaker will do more work on the Model 3 line that, according to Musk, should allow it to hit a production capacity of 6,000 Model 3s per week by the end of June. Tesla has struggled with production of the Model 3 since it launched last summer, repeatedly delaying production goals. One of the biggest changes will be an additional shift to Fremont’s general assembly, body and paint areas. As such, Fremont will move to 24/7 operations, Musk said. The longer hours of operations comes amid reports of alleged labor violations from workers and the National Labor Relations Board, which has a hearing scheduled over a complaint it filed against Tesla for June. Musk also announced changes to how Tesla handles expenditures internally. He recently said he thinks the company can achieve profitability by the end of the year, something that has long eluded the automaker. If there is something you think should be done to make Tesla execute better or allow you to look forward to coming to work more (same thing in the long term), please send a note to [redacted]@tesla.com.